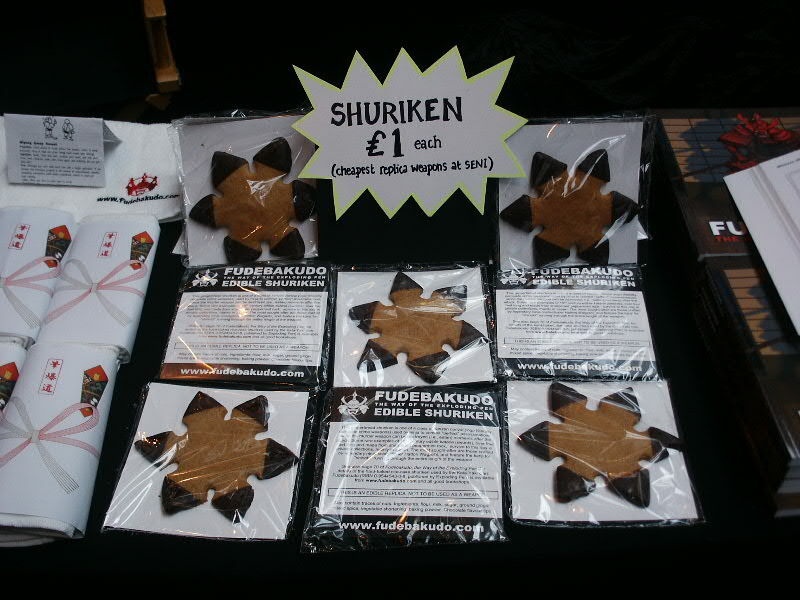 Photo of gingerbread shuriken at Seni 2005. I’m very glad we did Seni, but it was truly bonkers and a lot of it was not only weird, but also troubling... but that’s what you get when you roll the UK martial arts scene over to rub its underbelly: lots of ill-informed cultural misappropriation, variations of fetishism of combat to a degree that is Not At All Normal, and non-ironic deployment of Survivor’s “Eye of the Tiger”. Or bamboo flute music. You can read some (watered-down) reports of our times there on the Fudebakudo website. As well as the gingerbread shuriken (with chocolate-flavour tips) you can also see Fudebakudo time-wasting towels sneaking into shot on the left of this photo, each wrapped in authentic noshi-gami imported especially from Japan. We sold out of towels, but shifting 300 shuriken was pushing it a bit even for us, so we brought some of those back home.